Smash Up The Studio presents &quot;Soul Machine: Audio Version &quot; An extremely authentic collection of Soul and RnB loops in classic 1980's style. Classic 80's Soul and RnB keyboard progressions. Inject some real musical quality into your mixes with this superb selection of keyboard and synth loops from Smash Up The Studio. Classic 80's Soul and RnB keyboard progressions. producers who need professional results without having the luxury of top musicians. 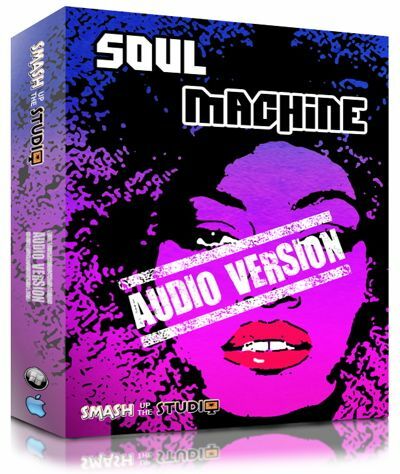 Smash Up The Studio presents "Soul Machine: Audio Version "
An extremely authentic collection of Soul and RnB loops in classic 1980's style. This sample pack features all of the loops from our best selling "MIDI Keys: Soul Machine"
recorded using vintage analogue synthesisers. ambient style progressions. 80 loops ranging from 2 - 16 bars in length. In addition to this, the pack also contains 7 construction kits. to your own requirements. The drums are for demonstration purposes and are not included. All loops are recorded in 24 bit audio in Wav and Apple Loop formats and each loop is tempo labelled.